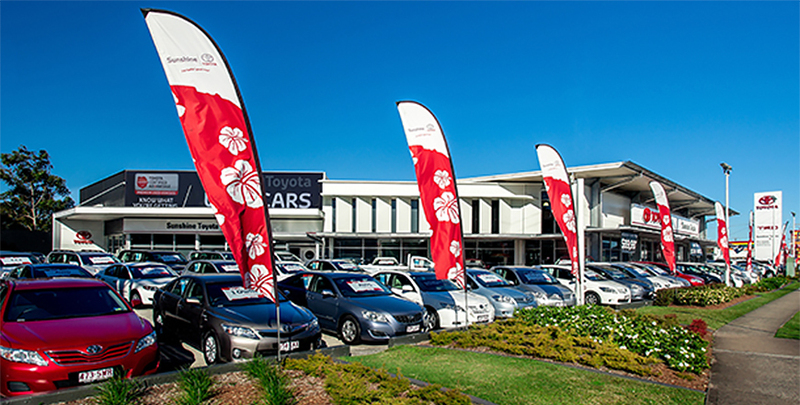 Sunshine Toyota is an award-winning dealership located in the heart of Australia's fastest growing region employing over 80 amazing Sunshine Toyota team members across three locations. Our Vision is to be a community leader, dealer and employer of choice. Our core values of respect, teamwork, integrity with a preparedness to "go the extra mile" to achieve great service are the basis of our fun and exciting culture. Our team work alongside our very stable and educated leadership team who have all been promoted internally in recognition of their exceptional achievements. We are very proud of the Toyota product, Australia's #1 automotive brand and services that we provide by delivering an exceptional "best in town" experience through innovation and continuous improvement in what we do. We are also proud of our partnership with Wishlist, Buderim Foundation, Alex Surf Life Saving Club and the work we do to give back to our local community. People who are highly motivated with excellent communication skills, prepared to work in a dynamic, fast paced, energetic environment able to provide expert advice and repairs related to the mechanical condition of vehicles. Experienced and competent in test driving and conducting final assessments of vehicles prior to delivery or return of vehicles to our guests. Candidates who have previous franchise workshop experience will be highly regarded. As part of our exceptional Toyota service technician team you will conduct servicing, diagnosis and repairs of automotive engines, transmissions and suspension systems. Guidance and mentoring of our apprentice technicians offering advice and service recommendations while providing a "best in town experience" within our fast-paced, high performing, cohesive team environment. When you join the Sunshine Toyota team you will benefit from a range of programs and benefits. Your interest in this role will be kept strictly confidential. Sunshine Toyota is an equal opportunity employer and provides a discrimination free workplace. Learn more about Sunshine Toyota here. People who are highly motivated with amazing attitude, energy and drive to succeed with a focus on exceeding our valued guests expectation within a friendly, fun fast paced environment. You would also have an open mind and preparedness to learn from our highly regarded and experienced sales coaches and mentors. Preference would be given to candidates who have excelled in customer service and/or retail sales previously looking for greater reward. As part of our exceptional sales team you will assist our valued guests find solutions for their automotive needs by selling both new & used Toyota vehicles while providing a "best in town experience" within our high performing sales environment that is often described by our guests as a place that makes them feel good. People who are highly motivated with amazing attitude, energy and drive to succeed with a focus on exceeding our valued guests expectation within a friendly, fun fast paced environment. You would also have an open mind and preparedness to learn from our highly experienced coach and mentor. Preference would be given to candidates who have excelled in customer service and/or retail sales previously looking for greater reward. As part of our exceptional advisor team you will assist our valued guests when servicing their Toyota vehicles, offering advice and service recommendations while providing a "best in town experience" within our fast-paced, high performing, cohesive team environment.